Hexagon is the polygon that has six equal sides and the six edges. Hexa is a Greek word whose meaning is six. Naturally, when all six sides are equal then perimeter will be multiplied by 6 of one side of the hexagon. Abd each internal angle is measured as 120-degree. 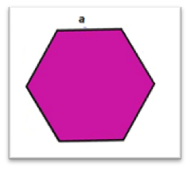 Take an example, if each side of the hexagon is marked as ‘a’ then the perimeter would be given as 6 * a. Where a is the side of the hexagon and all aides are equal in length. Hexagon has 6 sides and 6 angles. Length of each side of the hexagon is equal in terms of measurement. Each interior angle is measured of 120-degrees and the sum of the six angles would be 720-degrees. Each exterior angle is measured of 60-degrees and the sum of the six exterior angles would be 360-degrees. If you will calculate the diagonals of a hexagon, then they are total nine in numbers. s is the side of a hexagon. r is the Radius of a Hexagon.